Greenville is home to about 90,000 residents, and is the 10th largest city in North Carolina. The city recently experienced significant growth as the population increased by 23,000 over the last 10 years. Greenville is home to several pedestrian and bicyclist attractions, most notably East Carolina University (ECU). ECU enrolls about 27,000 students and employs about 5,600 academic and professional staff. Greenville’s most heavily trafficked roads are near ECU. As home to the city’s largest bicyclist and pedestrian population, the university has been the location of many traffic conflicts. Greenville also experienced a recent increase in crashes with a large portion of victims aged 20-24. Through Watch for Me NC, Greenville seeks to improve safety and accessibility around ECU and near the second largest employer, Vidant Medical Center. Greenville sees Watch for Me NC as an important component of their community outreach and views it as ongoing programming. Community support for Watch for Me NC efforts are growing and the Greenville Police Department believes that there have been positive effects in the targeted areas. Greenville’s Watch for Me NC program recently transitioned to a data-driven approach in which the police department collaborates with traffic engineers to review crash incidents and make built environment changes in higher-risk areas. Greenville’s Watch for Me NC partners have worked hard to distribute campaign materials at a variety of community events such as Safe Routes to School and Safe Communities events, National Walk to School Day, Bicycle and Pedestrian Commission meetings, local bike rides, bike rodeos, and National Family Volunteer Day. At the National Family Volunteer Day, 50 gently used bikes were distributed and police were on hand to teach the rules of the road and to distribute bike lights. These education and outreach events are complemented by about ten enforcement events each year. Greenville’s enforcement operations are focused on intersections and roadways with both high numbers of crashes and high bicyclist and pedestrian volumes. During operations, police issue written warnings and distribute informational brochures. 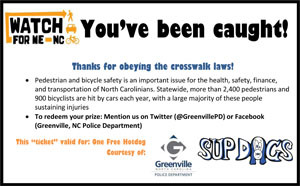 Greenville also has a “Good Ticket” initiative, where the police department distributes ‘tickets’ to pedestrians who properly use the crosswalks. The tickets include information about Watch for Me NC with Twitter and Facebook links, the local business sponsor’s logo, and a coupon. Officers embossed the tickets so they could not be duplicated. Greenville used many strategies to engage a wider cross-section of their population. In addition to its enforcement and education activities, the city aired radio announcements, created videos and circulated them using social media, developed more tailored posters to distribute with local businesses, and hung banners throughout the area, using all available resources and marketing options to reach the community. The Greenville Police Department received greater support and encouragement from the community when they conducted education activities prior to enforcement actions. These education events preceded enforcement actions and instructed residents about proper behavior prior to penalizing them for infractions. Thank you to Lieutenant Michael Montanye with the Greenville Police Department for providing leadership, time, and expertise that contributed to the Watch for Me NC Campaign in Greenville and the information in this profile.